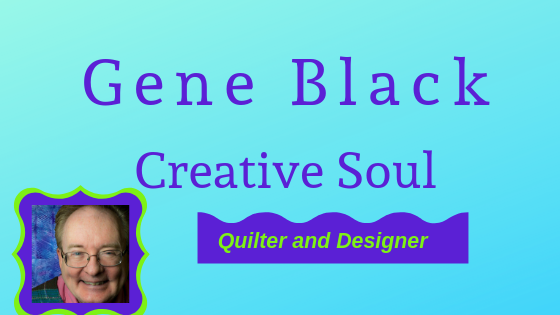 Gene Black an Alabama Artist and Quilter: What do you see? 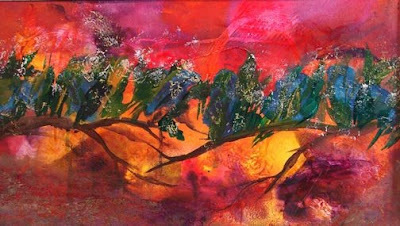 I am pulling out one of my paintings that hangs in my bedroom to show today. The only sewing I have done lately is quilting on blocks you have already seen - not exciting. Second reason: As this is hanging in my bedroom, I see it every morning. The brilliance of color and the mystery of the image adds a little magic to the morning. Gene, I read your title and looked at the image *before* reading the text, and I saw exactly what you described further down! It's lovely. Beautiful!! And a great sight to wake up to, especially if it is a dreary day outside!!! I went to the picture first and saw the birds before you ever mentioned them....what a wonderful painting...please continue to show more. I love the rich colors - I also see a face at the bottom of the picture of at least some eyes in the background that are looking out at you.. It is a happy vision not frightening in any way. I think they are enjoying the beautiful birds and rich colors.